The Victorian VET Funding Review has released an Issues Paper, ahead of making its final report to the Victorian government, due at the end of August. 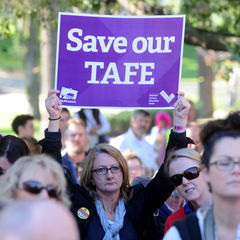 While it argues that TAFE needs greater support, the Review is operating on the premise that a contestable system will continue and will need to operate within the existing budget. The paper observes that, if properly implemented, contestability has the ability to drive innovation, efficiency and improvement, and empower students and industry to choose their training and provider. 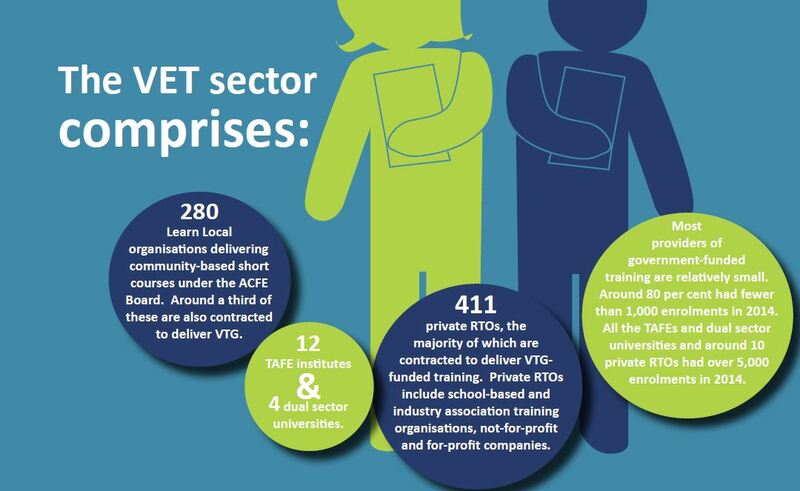 The VET Funding Review was an election commitment by the Andrews Labor government to provide a more sustainable model for public TAFE Institutes and private training providers, following the chaos that attended the introduction of fully contestable funding by the Baillieu/Napthine governments. The review, led by former Holmesglen chief Bruce Mackenzie with former Victorian Employers Chamber of Commerce and Industry chief Neil Coulson as deputy reviewer, spent three months consulting with employers, industry, training organisations and teachers, and received more than 900 submissions. Ensuring better support for TAFEs so they can fulfil their crucial role in the community. According to the paper the current system does not fully recognise the unique obligations on the TAFEs, or the value they provide. The current funding arrangements have had a significant impact on the TAFEs, which are not sustainable. It puts at risk the delivery of more expensive but highly valued courses such as apprenticeships, and programs for the disadvantaged. It does not propose, however, shutting out private providers a la South Australia. Rather it suggests a more robust “gateway”, such as a new provider classification system to regulate access to government funding, and provide an incentive for continuous improvement by providers This would presumably be somewhat along the lines proposed by the now abolished National Skills Standards Council, adopted by COAG but abandoned by the Abbott government, The Victorian government has already launched a major blitz to crackdown on “dodgy” training providers in order to lift standards in sector- the price tag of $9 million suggests that most, if not all, the 400 or so private providers with access to public funding will be audited. Under the current system, the Review finds that students and industry are not effectively influencing the VET market. As a result, the system has been led by course offerings by providers, resulting in mixed success in matching industry needs and training. The paper says that, as currently configured, the training system’s funding arrangements encourage a “counter-productive cycle of provider behaviour” and government response, creating instability in the sector. It suggests that reintroducing a compulsory student contribution to training (with appropriate concession arrangements) may also assist student decision making by making them more conscious of the costs of their VET choices and the value of their training entitlement, which can be too easily “burned” by unscrupulous providers enrolling students in inappropriate courses. 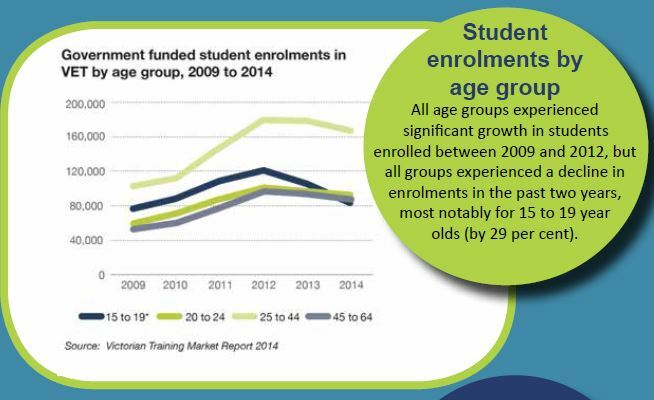 In 2014, approximately 40% of funding in Victoria was provided to just 20 courses. 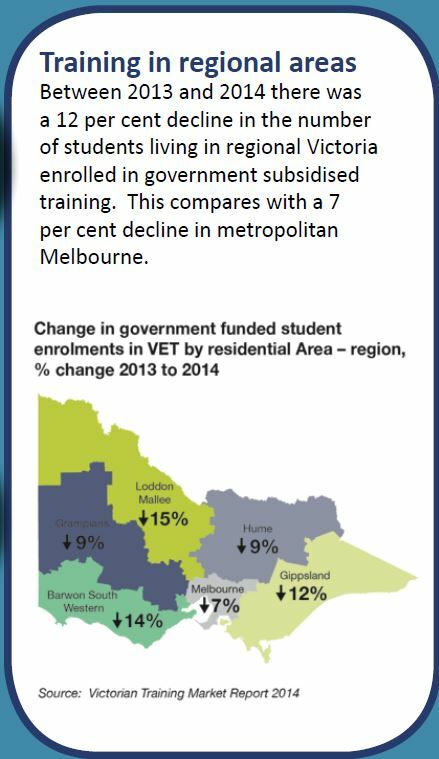 It suggests that reducing the number of courses eligible for government funding could make the system simpler, reduce the ability of providers to chase profit by chasing funding rates, and set clearer government priorities on the skills it wants for the Victorian economy. Taking into account the efficacy of a “price signal”, simplification and better targetting of funding to actual student and industry needs, the Review proposes ‘pricing framework’, with differentiated subsidy rates to match the level of skill needs. Funded courses and their subsidy levels would be selected based on clear objectives, such as the current and future skills needs of the Victorian economy, the likelihood that the course will provide improved employment opportunities for students, or other social policy objectives. Under this sort of arrangement, subsidy levels could also vary between regions, allowing the VET system to respond to different needs in specific regions. In releasing the report, Victorian skills minister Steve Herbert said the issues paper is “an important step in developing a new funding model that helps students get the real skills needed for real jobs and to ensure that industry gets the skilled workforce they need for economic growth”. The Review panel will further consult with employers, training providers and the community about the options detailed in the Issues Paper in the coming weeks. Submissions for the second round consultation close on 7 August.